Well here we are the Friday before Thanksgiving and if you're anything like me, you clean things up before you get them dirty again! It seems crazy doesn't it? But a little deep cleaning before your company arrives can't be a bad thing. I try to do a deep clean a few times throughout the year because in the kitchen especially, the dirt accumulates in crazy places. So here are a few things I like to do and some of the cleaning products I have been using with great success. Bona Hardwood Floor Cleaner, Ivory Dishwashing Liquid, Bar Keepers Friend, Sheila Shine, Tile Guard Premium Sealer and Applicator, Distilled White Vinegar. Let me talk briefly about each of these products. The Bona Hardwood Floor Cleaner is a product I found as soon as we moved into our new home. I usually steam mop my floors with the Shark Steam Mop on the “Mop” setting. I use the Bona floor cleaning system in between mopping. That way I don't feel like I'm over-using the steam mop on my wood floors. The Bar Keepers Friend is what I use on my stainless steel sink and my stainless cookware. It brings my cookware back to life. If you are having problems with the food sticking in your stainless cookware, just scrub the interior with this product. It helps tremendously! Sheila Shine is an outstanding product for your stainless appliances. I'll talk about this more in a minute. 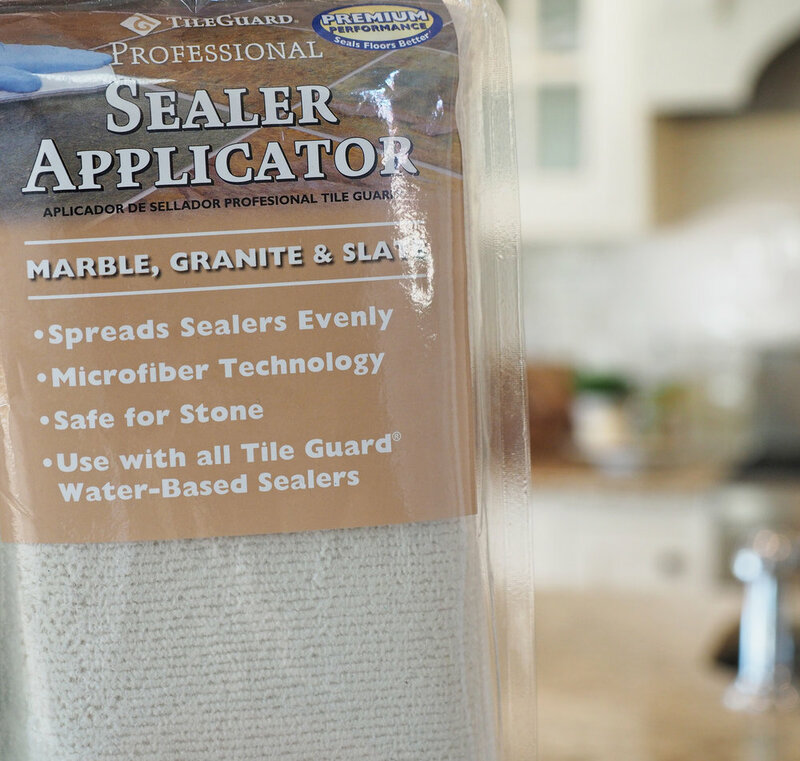 The Tile Guard is a wonderful sealer for natural stone and you must purchase the applicator because it does a wonderful job of spreading the liquid. Good ol' white distilled vinegar is good for just about every dirty job! Keep reading to see how I use a vinegar and water solution. So when it comes to stainless steel cleaners, I think I've tried just about all of them. I couldn't find one that was able to remove the water spots from my refrigerator and dishwasher. We have very hard water here in the county we live in and even with a water softener, we have horrible issues and water stains on stainless, chrome fixtures, porcelain and ceramic tile. It's miserable! My hubby walked in the door one day with Sheila Shine in his hand and said, "here, try this" and much to my surprise, no more water stains! I wipe down the entire refrigerator with a soft cloth. Hold over the sink and spray the Sheila Shine directly onto the cloth and then start wiping. Once you've finished, have a clean, dry cloth ready to go and then wipe off all the remaining residue. And let me warn you, wear a gas mask! This stuff is strong like a paint thinner! Please read the label with this and all products before use. Don't forget to open the doors and freezer drawer too! There are so many fingerprints inside the door. Also, if you have any food or liquid dried up on your appliances, use a wet washcloth to clean that type of dirt off first. I think this product is best for water spots and for bringing back the shine. Next up on the kitchen cleaning agenda are the cabinets. This is where that wonderful white distilled vinegar comes into use! Just google all the ways you can use vinegar and you'll probably be ready to throw-out all the other cleaning supplies in your pantry. This stuff is amazing and I absolutely love it for cleaning the glass cabinet doors. Distilled white vinegar and it's many uses. Here I have mixed up a solution for cleaning the glass front cabinets as well as all the cabinet doors and drawers. The mixture for cleaning a normal amount of grime is 1 to 1. You can fill a spray bottle or as I have done here, a bucket, however, mine is quite large! I used 1 cup of warm water and 1 cup of vinegar with a microfiber cloth dipped in the solution. Wring out the excess water and have a dry microfiber cloth on hand for this job as well. It's not a good idea to leave any water on wood cabinets and you will want to dry the glass as well to eliminate any streaking. Now that we're on the subject of microfiber cloths, do you dry yours in the clothes dryer or use fabric softener on them? DON'T! lol When mine come out of the washer, I hang them to dry. The dryer sheets and softeners leave a residue on them! You'll really be wondering why those streaks won't go away! I also use this solution to wipe down the cabinets and drawers for a squeaky clean outcome. 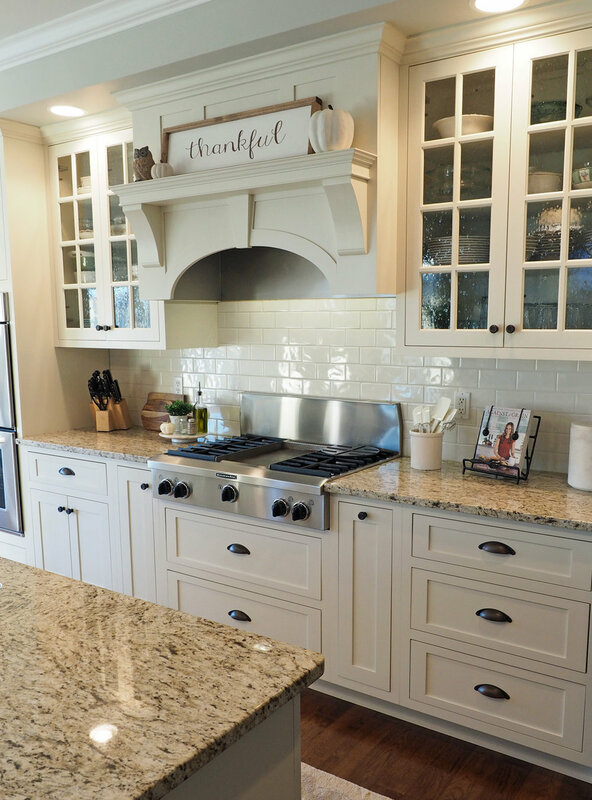 As a side note, our cabinets were factory painted with an oil based paint and a top coat applied so they are quite durable. (If you have latex paint on your cabinets, you may want to find another cleaning method.) If your glass is extra dirty or has a streaky film from commercial products, you should first use a solution of 2 c. warm water, 1/4 c vinegar and 1/2 tsp. of dishwashing liquid. Combine these ingredients in a spray bottle or bucket and then wipe down. You may or may not need to follow up with the 1 to 1 ratio but then all future cleanings should be good to go with the 1 to 1 ratio. Next up ... Scrub that sink! 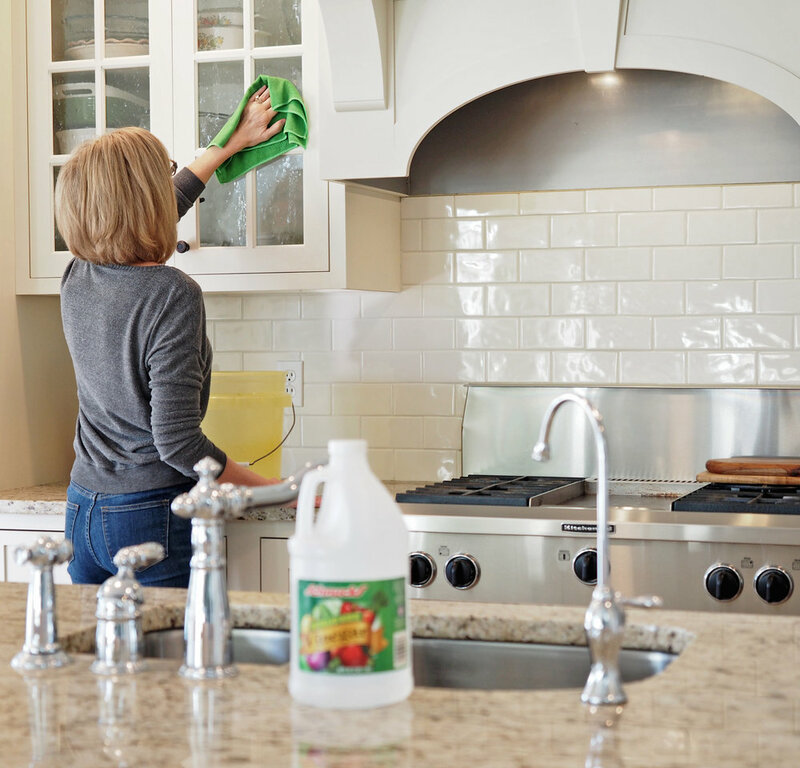 Whether you have stainless or porcelain, Bar Keepers Friend is the one for the job! I use a light duty scrubbing sponge on my sink and cookware and the results are fantastic. If you have a stained porcelain sink, you really should try this product. After cleaning the sink, sometimes I spray on a little Sheila Shine and wipe it out with a paper towel. Looks great! In our previous home I had a porcelain sink and was always bothered by the scratch marks from pots and pans. I was forever babying that sink but when I found Bar Keepers, my life turned around. When we built our current home, I decided to switch to a stainless sink and eliminate all the worry. Bar Keepers is still my go to product for a beautiful clean finish. Next up ... Granite cleaning! Next up ... Hardwood floors! Bona Hardwood Floor Cleaner is the bomb.com! lol Does anyone say that anymore? I'm excited to talk about our hardwood floors because on my Instagram account @wowilovethat - there are many, many questions and DM's regarding our floors. What are they and how do you clean them?! So here you go folks! First off, our hardwood is everywhere on the main level of our home except for the bedrooms, bathrooms and laundry. We have pre-finished 3/4" hardwood flooring by Mulligan Flooring. The style is called Muirfield 4" planks, the color is Provincial and the wood species is Hickory. I think they add more of a shiny finish on the factory floors versus what people usually go with on their jobsite finished floors. Everyone thinks my cleaning has something to do with that shine, but in reality, it is the flooring we chose. Don't get me wrong, Bona brings out a luster too but the majority of the shine comes from the flooring finish itself. As you've probably figured out by now, my go to hardwood floor cleaner is Bona! This giant mop head is amazing as well! Spray the mop head or spray the floor directly, it works the same either way for me and it does a fantastic job. 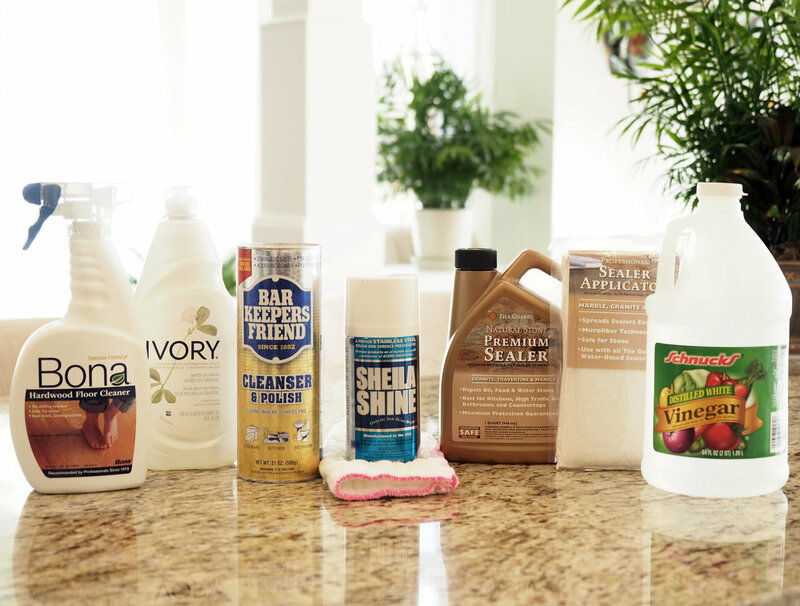 So that wraps up this post on cleaning products! I hope you’ve enjoyed it and hey, have fun cleaning everybody! And the finished product is one super duper clean kitchen! Have a Happy Thanksgiving everyone! Let me know in the comment section below if you have any questions.